The Cowen 60 Frame Stainless Steel Air Ram Extractor is a two-man operation. Designed for the medium commercial beekeeper, the 60 Frame can extract a minimum of 36 boxes per hour. This makes it possible to extract at least 288 boxes in one eight-hour day. We have customers that do a lot more than that in a day. 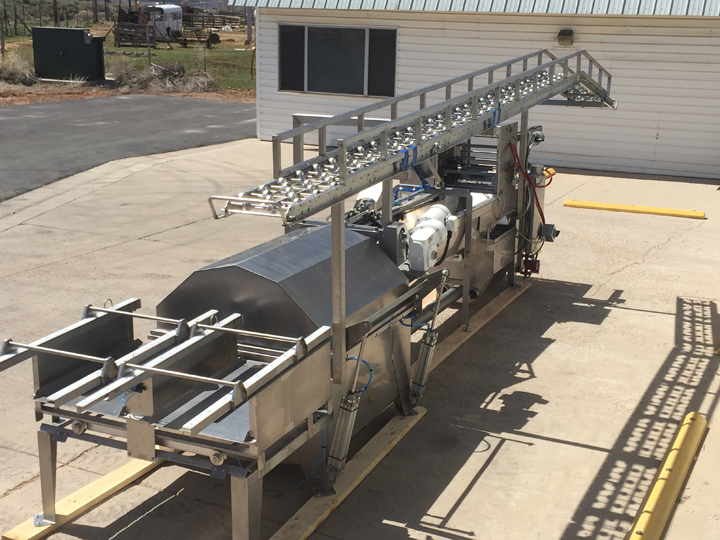 The 60 Frame Stainless Steel Air Ram Extractor features a power loading conveyor, stainless steel reel, automatic self adjusting drive, and a stainless steel tank. After combs are placed in the Uncapper, they are carried to the extractor by a power conveyor and mechanically loaded into the reel. By pushing 30 full combs into one side of the stainless steel extractor reel, the 30 empty combs are pushed out onto the unloading rack to await re-boxing. The extractor works at the flick of a switch and acceleration is automatic. While the extractor is running, the operator has adequate time to re-box the empty combs and repeat the uncapping process so that operation is continuous. A normal extracting cycle lasts approximately 7 to 10 minutes. The power required for the 60 Air Extractor is 40 amp 230 volt single phase. For more information about the 60 Frame Air-Ram Extractor, please contact us below.